which took the architects of the Holocaust to task, were based here. Today, Nuremberg is a fascinating place to visit precisely for this dramatic history, which it memorializes honestly and sensitively. North of Munich, Nuremberg is a liberal enclave in conservative Bavaria, known for its gingerbread and bratwurst (which you can try at Bratwursthäusle) as well as its political history. This was a fun town to visit. They were having a festival at the time and the town center was filled with vendors and exhibits. The city center is filled with small shops and eateries and is easy to navigate. One of my fav cities in Germany!!! If you go in December, don't miss the Christkindlesmark and eat Lebkuchen cookies. I lived in this city for 3 years in the early 1960's. It is my 2nd favorite city in the world (after Edinburgh, Scotland). The Medieval old city has been restored to it's original 15th century look and the castle (the largest Medieval castle in Germany) is sensational. The city was 95% demolished shortly before the end of WWII and was totally rebuilt after the war. This was possible only because the 15th and 16th century city plans had been saved which means that the old city appears much as it did centuries ago. I will be reviewing restaurants in this guide and I add this preface to this guide. I go to Germany for German food besides my general love for the country. I have heard about good Japanese, Thai, Korean, Italian, Mexican, South America, etc. restaurants in German cities, but I don't go to any of them. If I want Mexican, why would I travel all the way to Germany to eat it. There are more than an adequate number of German restaurants that are also very good, so I go there. If I want Bavarian cuisine I go to Munich; if I want Frankish food, I go to Nürnberg; it is that simple. So don't expect to find restaurant reviews where you will find more English spoken than the local language or dialect. Further, I will not be critical of any restaurant that I have not visited 3 or more times. Fair is fair. 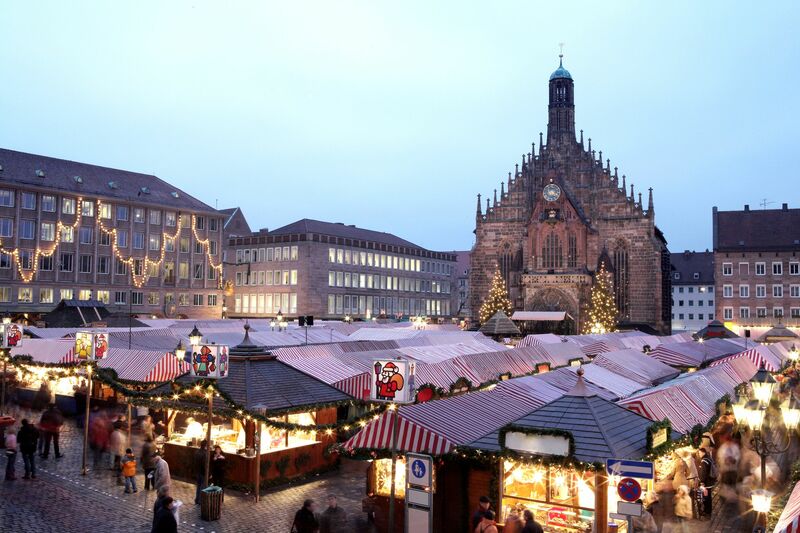 The Nürnberg Christkindlesmarkt is the most well-known Christmas Market in the world and is simply beautiful. The photo shows a few of the multiple kinds of lebkuchen (soft gingerbread) available during the Christmas Market. Nürnberg should not be missed! In the coming months I'll write more extensively about this very important historical city.